With the FIFA World Cup 2018 kicking off today in Russia, here’s a look at all 12 of the stadiums that will be hosting games over the next month. Starting today, 14 June 2018, and continuing until 15 July 2018, the contest will see 32 national football teams compete for the coveted World Cup trophy. Matches will take place in 12 stadiums, located in 11 different cities. Venues include the Russian national stadium in Moscow, as well as new stadiums by architects including Populous and GMP Architekten. Home to the Russian national football team, Luzhniki Stadium hosts the opening game between Russia and Saudi Arabia, and will also be the venue for the cup final on 15 July 2018. Originally built in 1956, the historic stadium was a venue for the Olympic Games in 1980, and has hosted over 3,000 football matches. 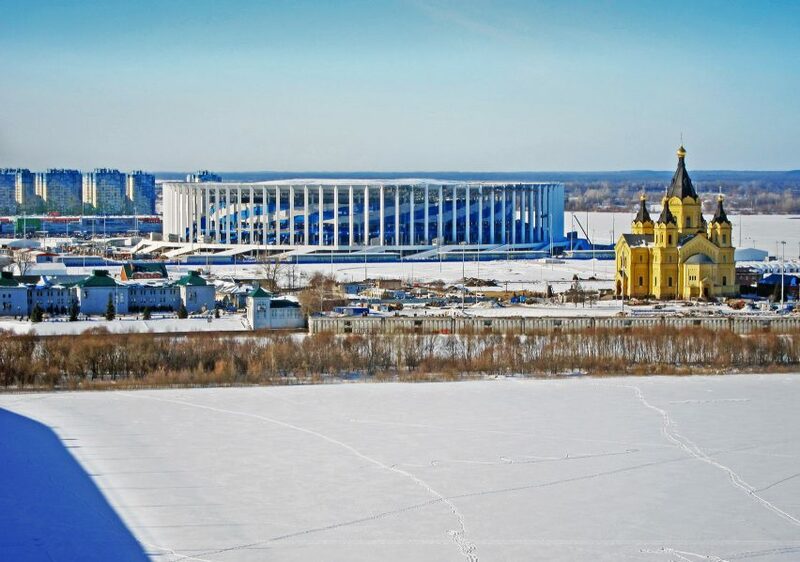 In preparation for the World Cup, the stadium has undergone a four-year renovationby Moscow-based architecture studio Speech, which saw the athletics track removed and the capacity increased from 78,000 to 81,000. Designed by Japanese architect Kisho Kurokawa, this 78-metre-tall stadium was designed to look like a spaceship. 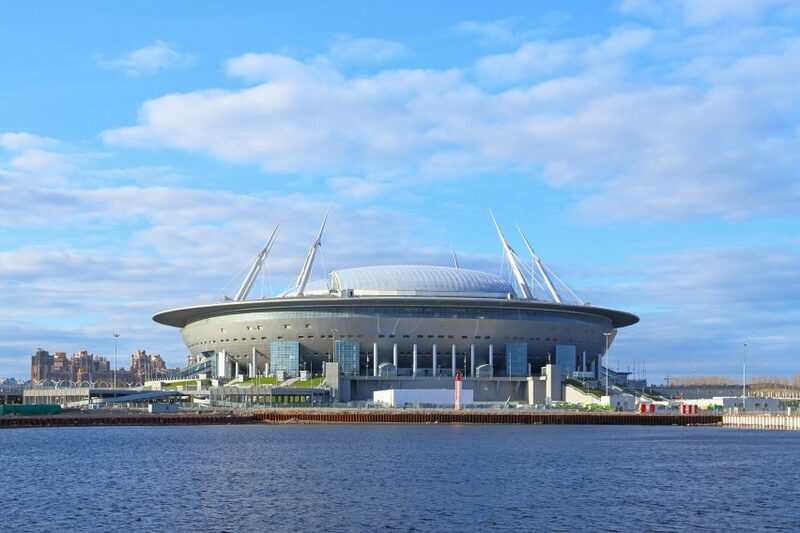 Opened in 2017, Krestovsky Stadium, which is the home of Russian football club FC Zenit St Petersburg, will be known as the St Petersburg Stadium during the tournament. The modern stadium features a retractable roof, to allow games to take place in all weather, and a 67,000-seat capacity. The stadium is set to host seven games, including a semi-final and the third place play-off. Fisht Stadium was designed by Populous as the venue for the opening and closing ceremonies of the 2014 Winter Olympics. Originally completed as a covered arena, the stadium has had its roof removed and has been reconfigured for the World Cup. During the tournament, the 48,000-capacity stadium will host six games, including Portugal versus Spain and a quarter final. Originally built in 1953, the Central Stadium is home to FC Ural, one of the country’s oldest football clubs. The venue has been refurbished for the World Cup, and two temporary stands have been added outside the stadium to increase seating capacity to 35,000. Following the World Cup, the temporary seating will be removed. The second venue in the capital that will be hosting games during the World Cup, Otkritie Arena is the home of Russia’s most successful club, Spartak Moscow. 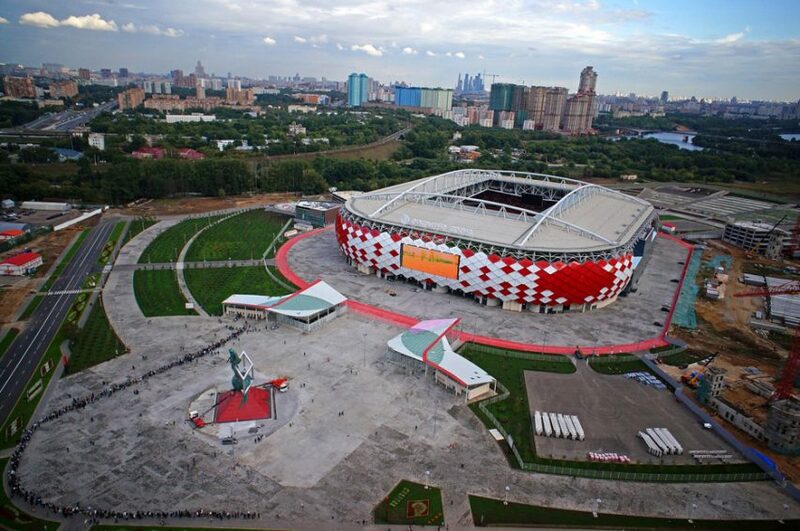 Built in 2014, the venue will be known as the Spartak Stadium during the tournament. The stadium was designed by London-based architects Sport Concepts and is wrapped in a facade of hundreds of diamonds to represent Spartak Moscow’s logo. It will host five games, including Belgium versus Tunisia. 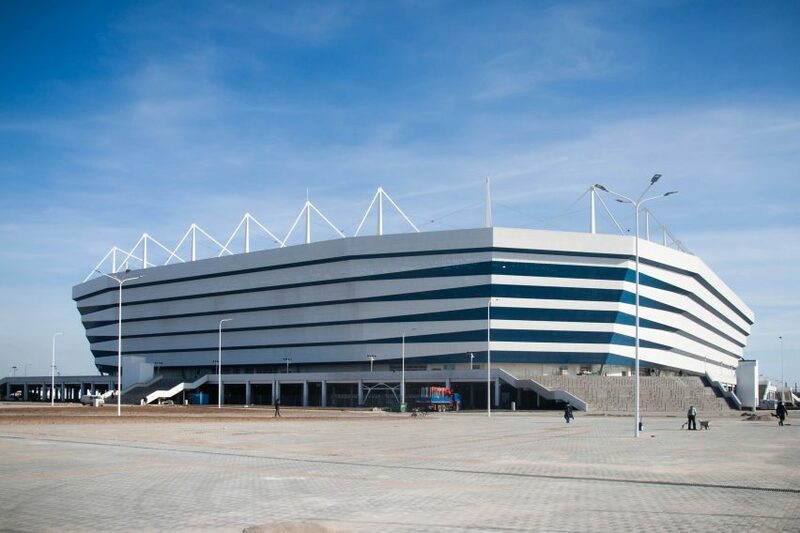 Built specifically for the World Cup, Nizhny Novgorod Stadium was designed by Russian company Stroytransgaz. The 45,000-capacity stadium is wrapped with an external colonnade, which will be lit up during the games. It plays host to both Argentina and England during the tournament, and will become home to football club Olimpiets after the World Cup. 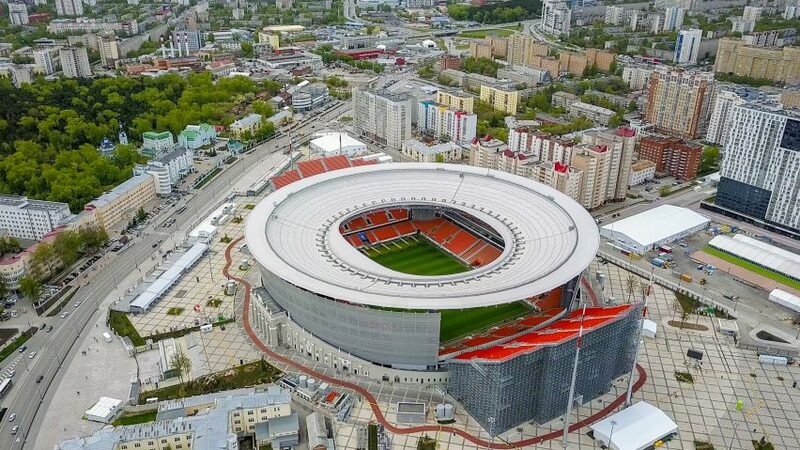 Another stadium purpose-built for the World Cup, the Mordovia Arena was designed by Russian company SaranskGrazhdanProekt. The oval-shaped arena is clad in bright orange, red and white panels to reflect the arts and crafts pieces created in the Mordovia region. Following the tournament, the stadium’s upper stands will be dismantled to reduce the capacity from 44,000 to 25,000. Built to host the opening and closing ceremonies of the Summer World University Games in 2013, the Kazan Arena will host six games during the tournament, including France versus Australia on the opening weekend. The stadium was designed by Populous to resemble a waterlily from the air. It boasts three digital panels on its exterior, covering an area of 4,200 square metres. 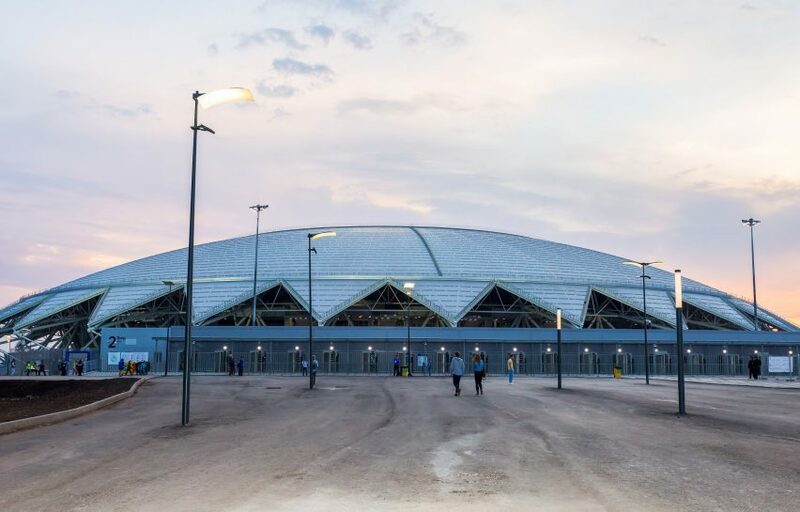 Opened in 2018 in preparation for the World Cup, the Samara Arena takes design cues from space, reflecting the region’s connection to Russia’s aerospace programme. It was designed by Russian architect GUS SO TerrNIIgrazhdanproekt and features a 65.5-metre-high domed roof. 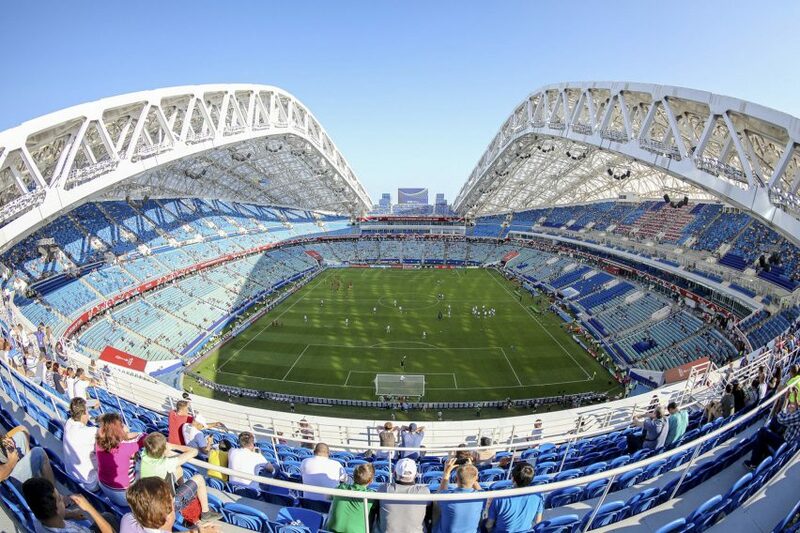 The 45,000-seat stadium will host six matches during the tournament, including Russia versus Uruguay. 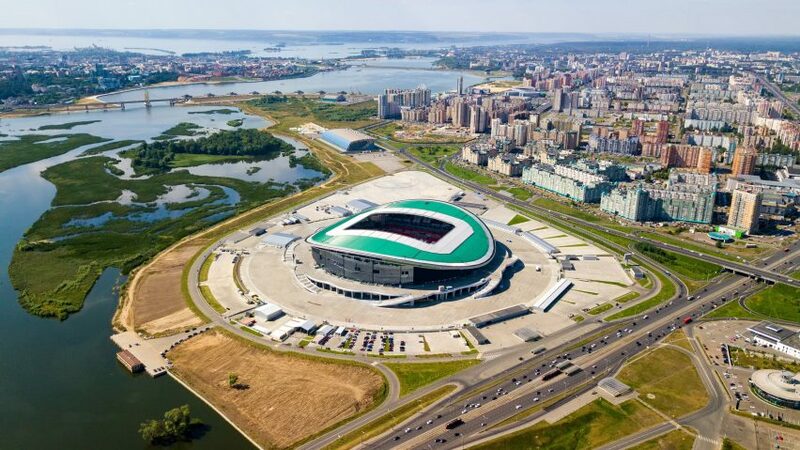 A new stadium for the World Cup, the venue opened in April 2018 on October Island, in the Russian enclave of Kaliningrad. 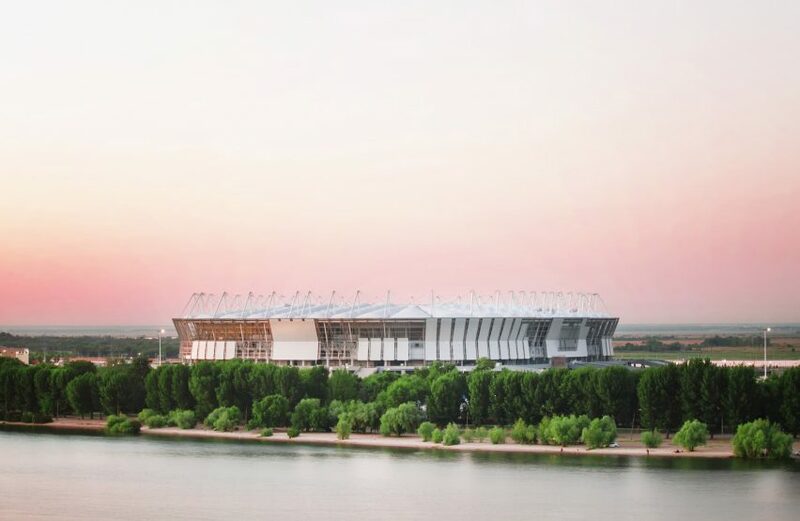 Designed by French architects Wilmotte & Associés, the stadium is designed with orthogonal facades to be in keeping with its urban context. The stadium is set to host four World Cup games, including England’s crunch match against Belgium. 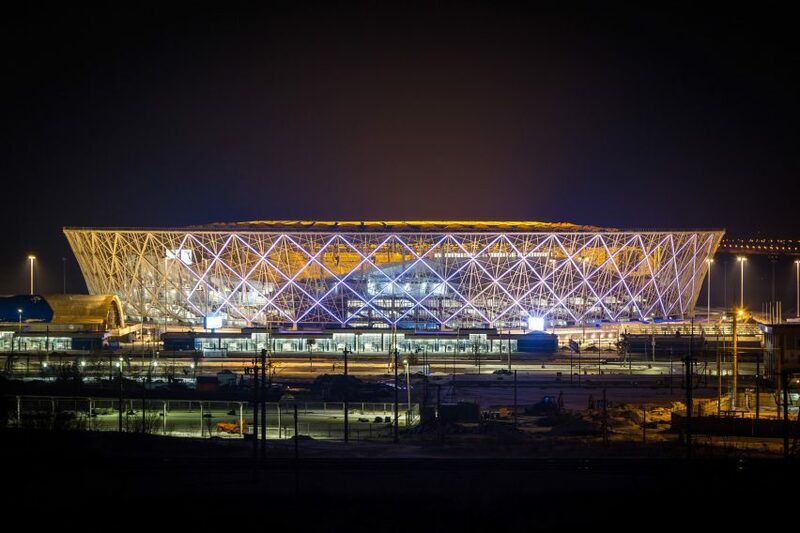 Replacing the historic Central Stadium in Volgograd, this new stadium was designed by German architecture practice GMP Architekten for the World Cup. An oval grandstand bowl that surrounds the pitch is covered by a circular structure, with its facades designed to have a woven texture to reflect Russian weaving. 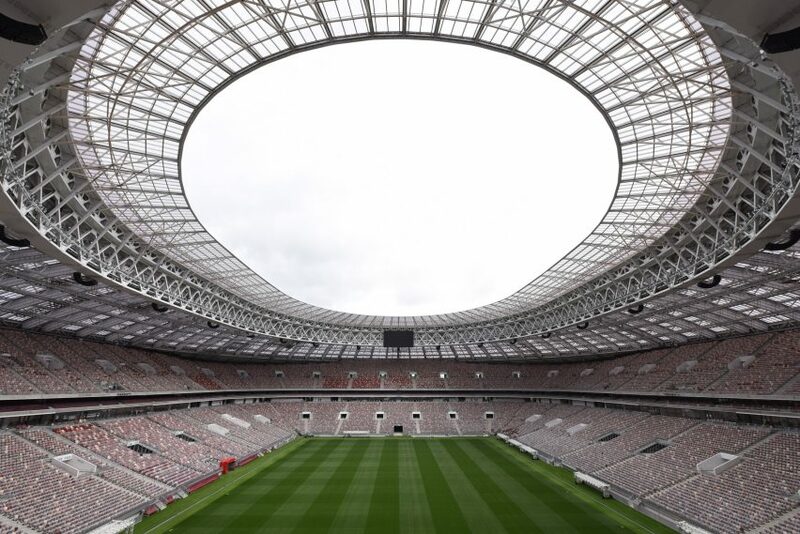 Four games, including England’s clash with Tunisia, will be played at the 45,000-seat venue. 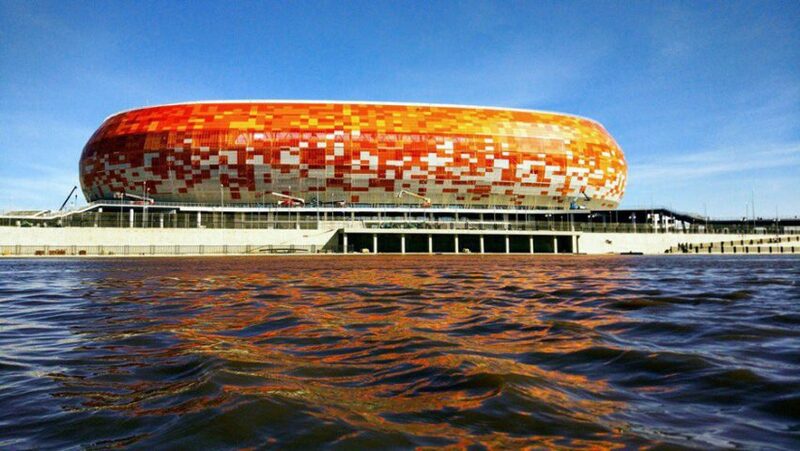 The Rostov Arena is the third stadium designed by Populous that will host games during the World Cup this year. Originally designed with an irregular shaped roof, the stadium was instead built as a regular bowl with 45,000 seats. Following the tournament, the stadium will become home to FC Rostov.